IBEW - Bit Space Development Ltd. The electrical construction industry is inherently dangerous and safety is paramount. There are dangers on all job sites, particularly for inexperienced new entrants such as youth, Indigenous people, women and newcomers pursuing pre-apprenticeship training. Virtual reality technology is proving to be a powerful tool in developing immersive training resources that allow most-at-risk workers to experience the hazards of a job site safely from a classroom. The resulting increase in awareness of safety hazards leads to the adoption of safe work practices. Virtual reality refers to computer-generated environments that simulate a person’s physical presence in the real world, enabling the user to partially determine what happens in the environment. The technology allows a pre-apprenticeship trainee to virtually explore a jobsite through a 360 degree lens using a cell phone and an Oculus headset. Winnipeg-based interactive digital media company Bit Space Development Ltd. is the technology provider for the project. It will provide technical support on a user-pay basis and is available to customize the application. Founder and CEO Daniel Blair said that it took his team of 10 developers, designers and photographers about a year to produce the five modules. 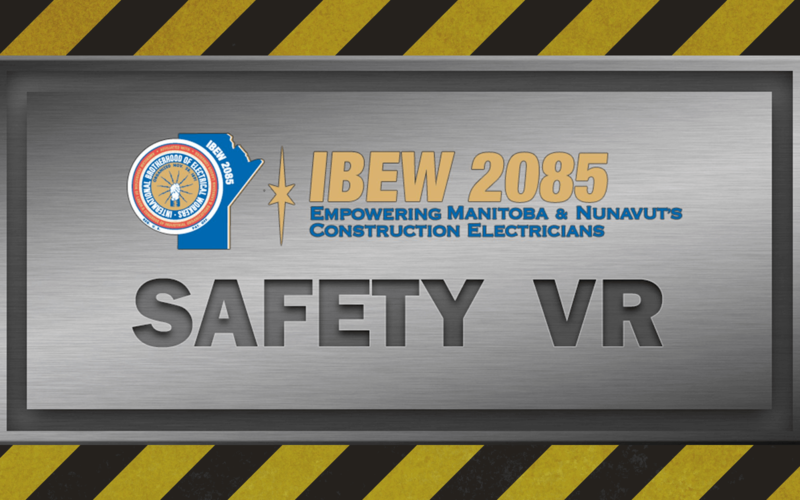 In November 2017 IBEW Local 2085 pilot tested IBEW Virtual Reality (VR) Safety with about 20 electrical pre-apprenticeship trainees at its IBEW Code of Excellence training centre in Winnipeg. IBEW Local 2085 director of apprenticeship and training Chris Taran observed that “the younger trainee cohort embraces virtual reality learning technology compared to traditional talking-head lectures and demonstration-style teaching. “The challenge in our pre-apprenticeship program is that while we are tasked with preparing trainees for work, we cannot just bring them to a real job site. With IBEW Virtual Reality (VR) Safety, trainees put on VR headsets and become aware of the dangers without being in harm’s way.” He is careful to note that resource is intended as an awareness application for use with pre-apprentices – not apprentices – and does not replace safety training at local safety associations or on the job. The project benefited from partnership-building. IBEW Local 2085 was awarded a grant from the Workers Compensation Board of Manitoba. Development moved forwarded in partnership with United Association Local 254, boilermakers and other members of the Manitoba Building and Construction Trades Council as well as the Construction Safety Association of Manitoba and Manitoba Construction Sector Council. Executive Director of the National Electrical Trade Council.